We play Malacca Straits roulette, eating a different hawker style dish every day until we get a dud. Well, that dud dish never came after fourteen visits, so we declare Malacca Straits the winner. We'd been to Malacca Straits a few times for dinner and loved it, particularly the byo chili mud crab. Only recently we realised the hawker classics here are top notch too, which is impressive considering the breadth of the menu, and also considering it's halal - there's no easy pork fat shortcuts to victory. Chef Tan and co have a style we like, and a deft touch on the wok consistent in every dish we tried. There's still another dozen or so hawker dishes on the menu that we hope to sample, we'll get around to them sooner or later. Hopefully sooner because Chef Tan isn't getting any younger, only more handsome. Malacca Straits has become a favourite B-Kyu lunch spot over this stinky hot summer. 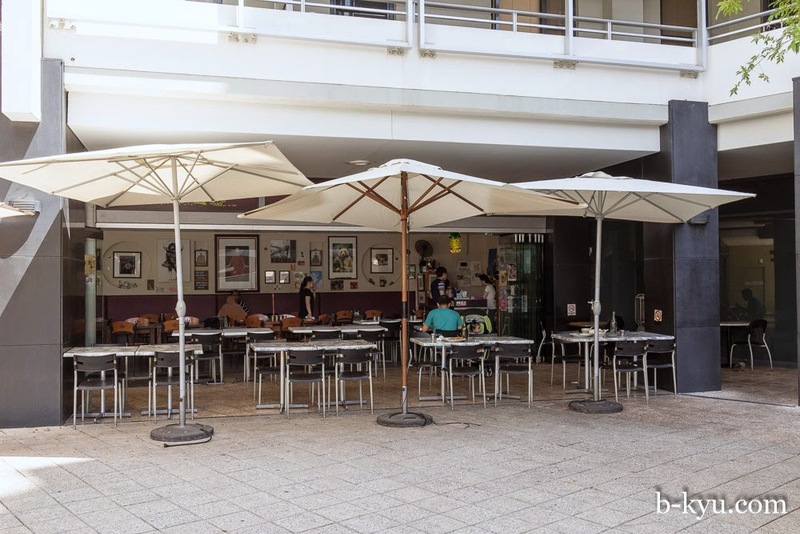 Being in a courtyard of sorts it's a quiet escape from the rampant traffic of Broadway. The concertina doors open to let in the breeze and give the place a relaxed vibe. The sound of the courtyard fountain helps us pretend we're on holiday, not a lunchbreak. Malacca Straits gets packed with university staff and students at peak lunchtime. If we can rig a late lunchbreak we prefer to hit it around 2-3pm when it's quiet with just a few other punters. There's sometimes a gaggle of Malay ladies-who-lunch around this time providing bonus atmosphere. 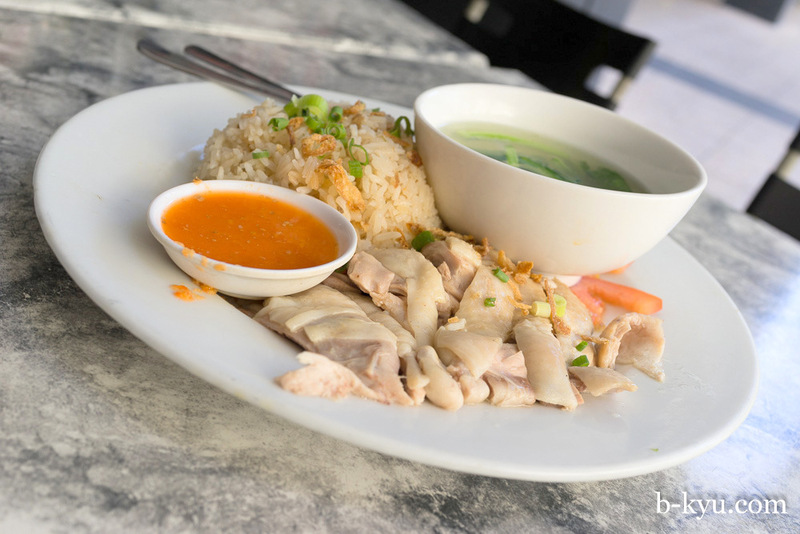 Hainanese chicken rice - $10. Good wet chicken with a fresh gingery smell from the chilli sauce. The chef has a special way with rice, it is lightly chook flavoured with a dry-ish, course texture that is amped up with fried shallots. We guess the rice is twice-cooked somehow to get that wonder-texture. 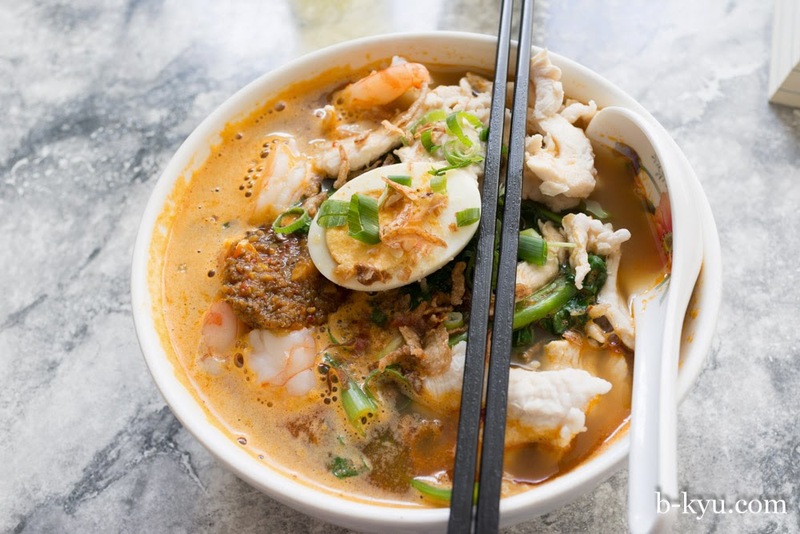 Assam laksa - $11. This is Shawn's favourite lunchtime dish at Malacca Straits, particularly when he feels like something spicy but not lardy. The mix of sour, fishy, fresh and funky flavours come together for a wild soup party. 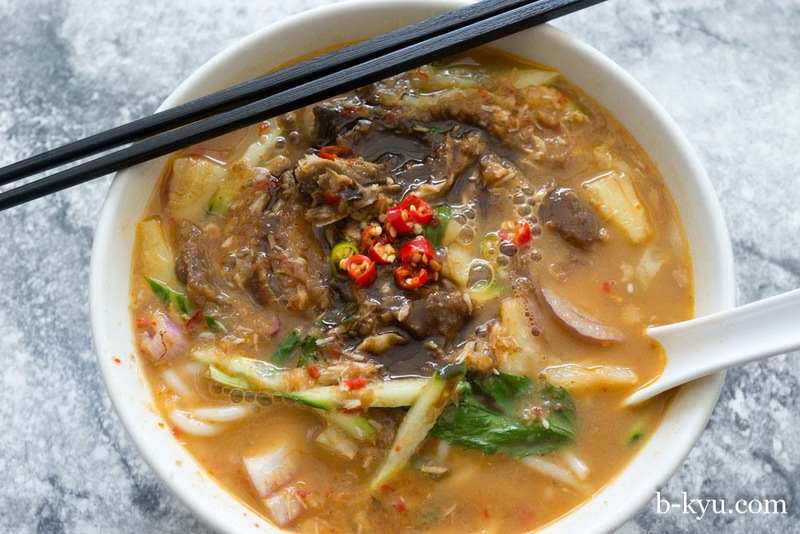 Being coconut-free, assam laksa is way healthier than curry laksa. The first time we had this a Malaysian (or maybe Singaporean) lady at the next table took one look at our assam laksa and ordered one for herself, then ate the lot. Now that's a thumbs up. 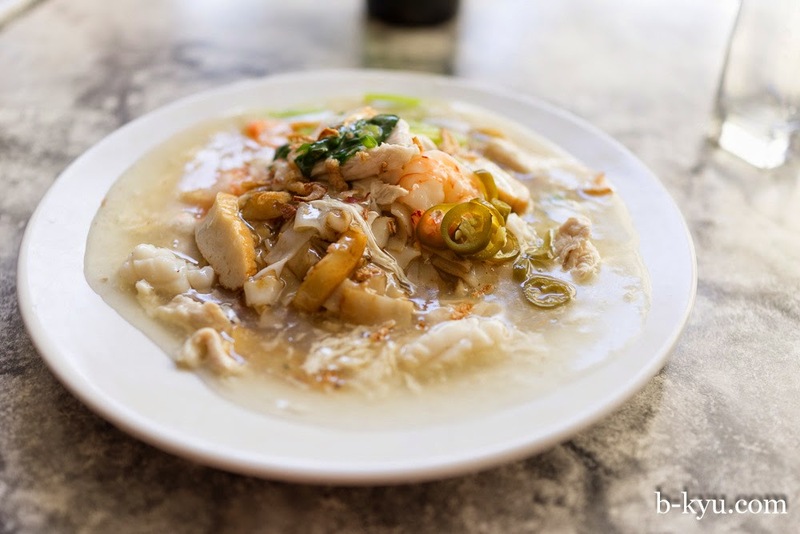 Kway teow noodle soup with chicken - $10. 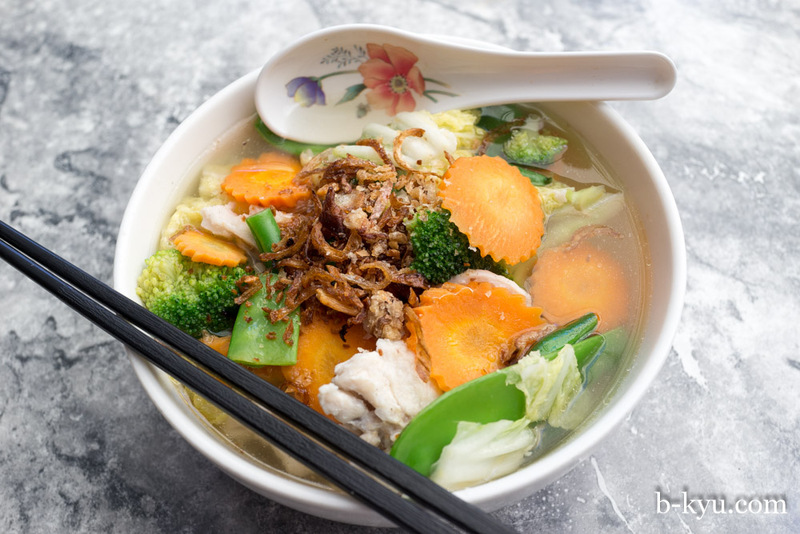 The carrots and broccoli make this classic Malaysian soup look a bit Aussie-fied but rest assured there's a goodness beneath. Kway teow soup has a clean, simple broth which is perfect if you feel like something light, a soup we've learnt to love over the years. 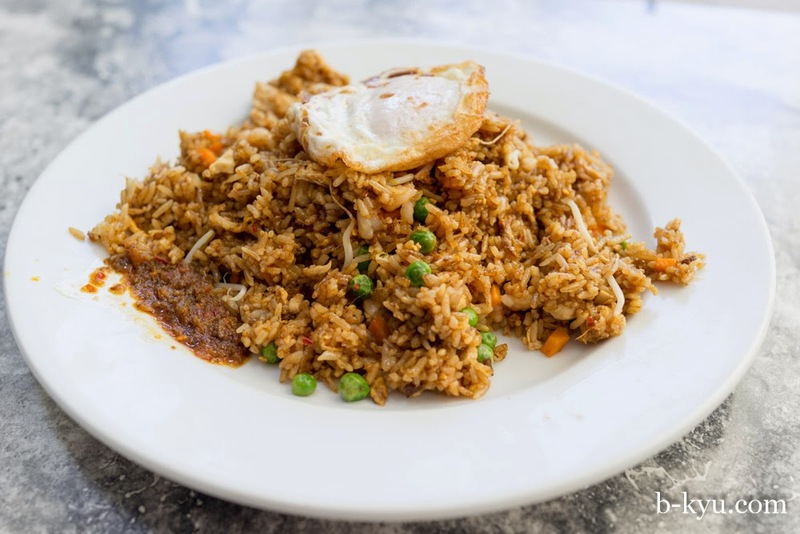 Nasi goreng - $11, egg +$1. The rice has a nice balance of belecan (shrimp paste) and tomato (we reckon some places go overboard with tomato flavour). It has diced chicken, peas, and a smidgen of bean sprouts. The fried egg has a runny yolk that we love to mix in with the rice. The best part is the sambal which has a strong prawn flavour to it and a mild chilli heat. It's a a huge serve. Shawn makes a dividing line to try and eat only half. It's hard. He types notes on his phone to stop himself from eating more of this delicious calorie-fest. He manages to leave a third. 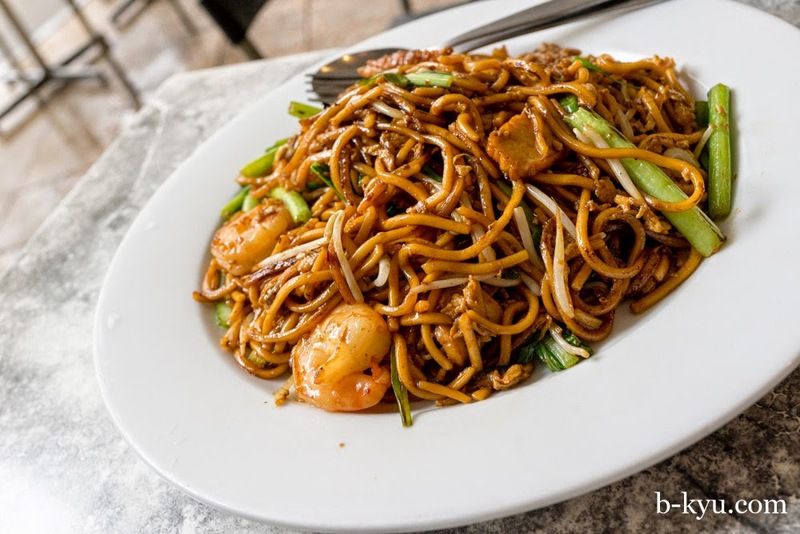 Mee goreng - $11. Like with the nasi goreng there's a nice balance of flavour here, the chef has a great touch. The big flavour wallop comes from that beautiful prawnie sambal. Many folks would disagree but we'd love way more sambal and a third of the noodles, it's a monster serve. The carbfest is topped with some fish cake slices, a few good prawns, and some Chinese greens. Chai tai kueh - $12. Fried radish cake. This is way less stodgy than other versions of this dish we've tried. The fried radish cakes are golden on the outside with a lovely white moist goo in the middle. The lardy radish cakes are lightened and livened up bean sprouts and shallots. It's all brought together with egg and Malacca Straits' amazing super sambal. Chef Tan just has a lovely, deft touch on the wok. If Shawn was a girl or a bear he'd give Chef Tan a kiss. Har mee - $11. Malaysian prawn soup is a B-Kyu favourite. Malacca Straits does a pretty good one with a nice prawnie stock, Chef Tan definitely knows his way around a shrimp. Like a classic har mee it has thick and thin noodles, the thick ones help you grip the slippery thin buggers. It's halal so there's none of those little crispy porky lardy bits, but there's plenty of chicken. Wat tan hor (kway two siram) - $11. Flat noodles stir fried so they get a lovely wok hei, that smokey 'breath of the wok', which infuses with the thick gooey sauce that is plain by design, but has a touch more flavour than other places, an extra dash of chicken stock perhaps. It's fleshed out with prawns, chicken and fish cakes. Love those pickled chillis which are very similar to jalepenos. Nasi lemak with fried chicken - $10. 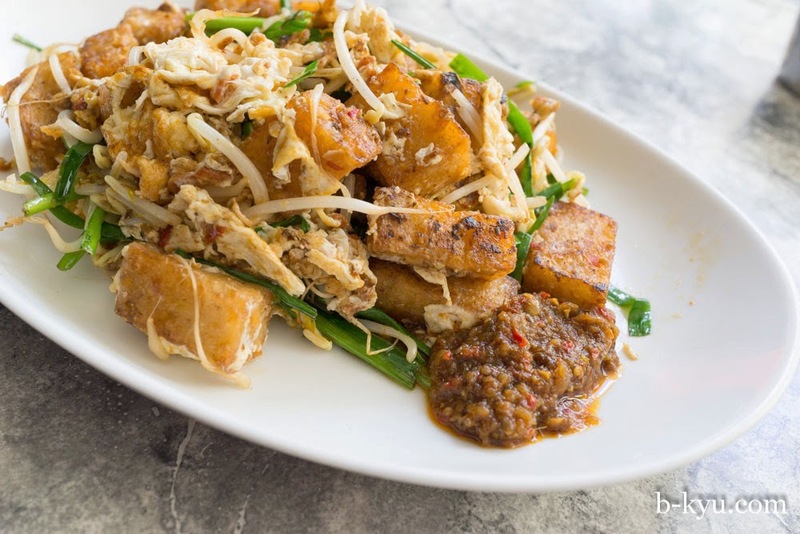 It's not a purist nasi lemak but it's an excellent version of this Malaysian breakfast classic. Comes with fried chicken which has skin like a Chinese style crispy chicken and some nice roasty flavours to the flesh. Chef Tan cooks a mean bird. The rice has a similar texture to the Hainanese chicken rice, but with coconut kick, love that rice! 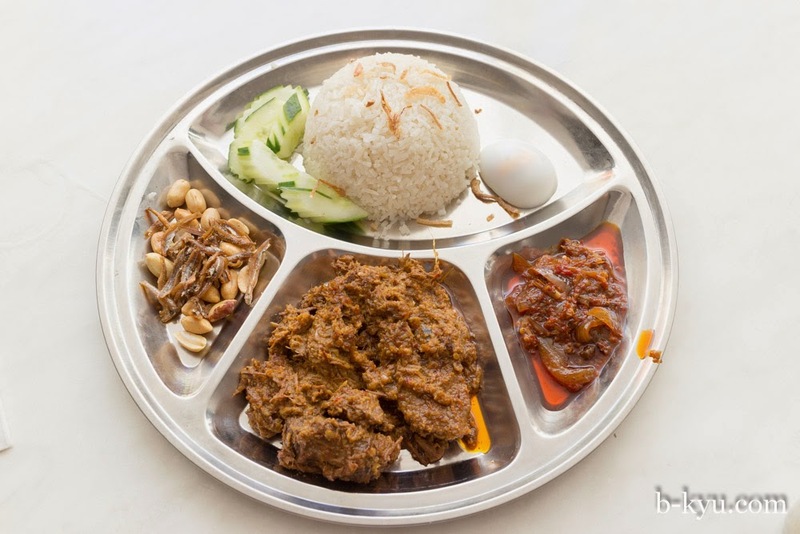 Nasi lemak with beef rendang - $10. Same same as above but with a big hearty serve of rendang. The rendang has been cooked down dry with toasty coconut notes. Oh how we love a dry rendang. 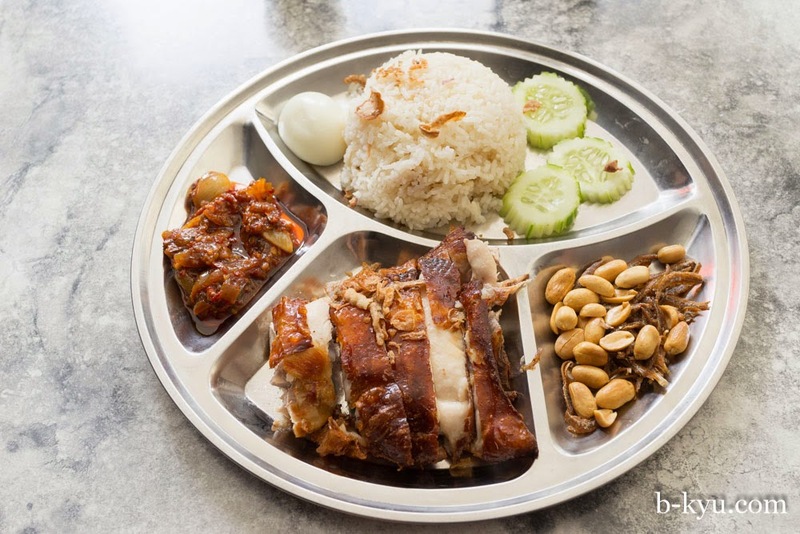 It's excellent, though we reckon nasi lemak always works better with chicken than beef. Always. 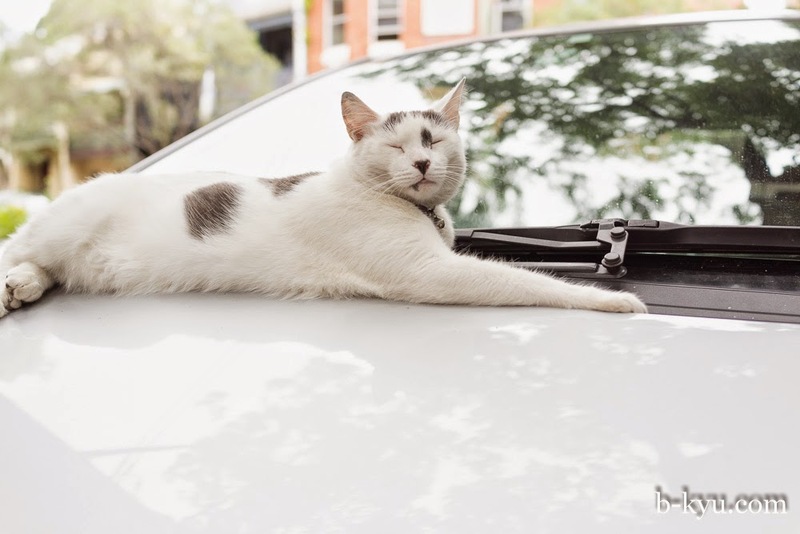 Mr Tobias J Pussycat adjudicated the roulette from his office in Chippendale with his legal team present. 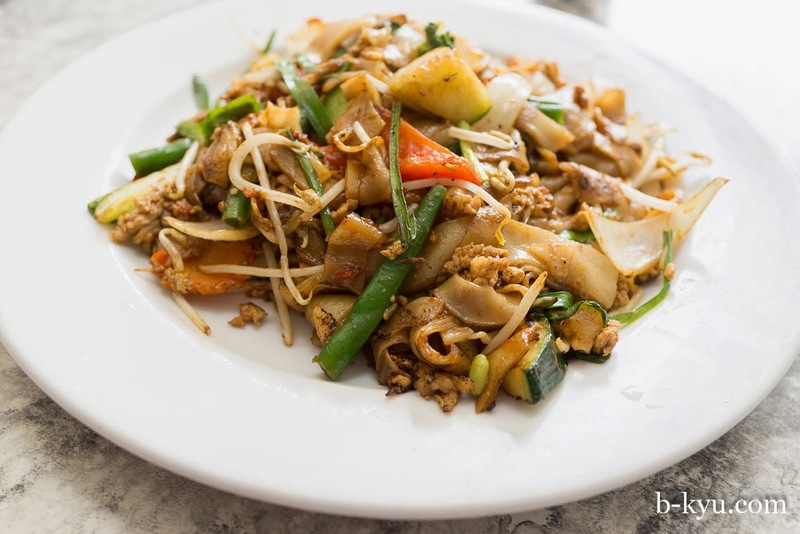 Pad kee mau - $10. Think char kway teow with chili and basil thrown in. The little eggy bits between the noodles soak up the oil, chili and basil forming a wonder-goo mixture of umami and spice. We'll be back for this one. Fried mehoon - $11. Thin noodles stir fried with prawns, veg and fish cake. Not a big flavour but the light texture of the noodles make up for it. 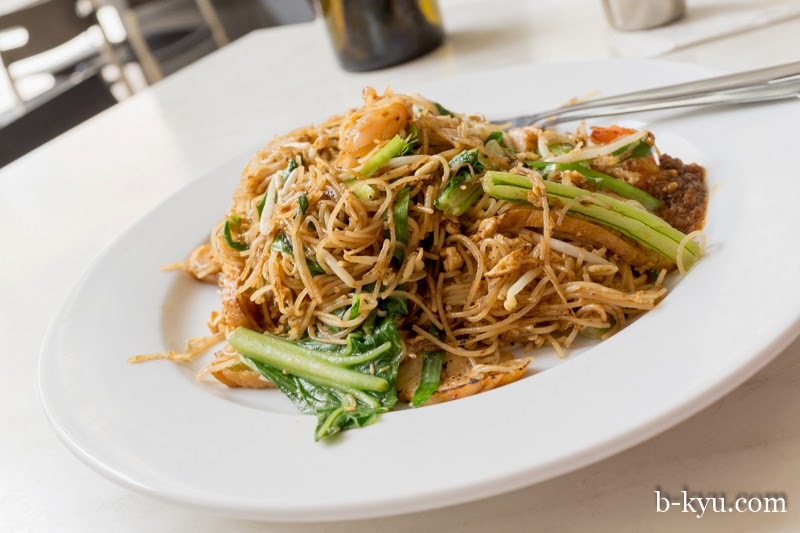 Malacca Straits is at 5/66 Mountain Street, Ultimo NSW 2007. It's in a coutyard sort of area also accessible off Broadway, opposite Notre Dame University - in the dip between UTS and Broadway Shopping Centre. I love this place. Great review. Thanks. i've yet to byo mud crab but i freaking love their assam laksa! and the salted egg yolk eggplant is so addictive! Great review again, thanks. I believe the chicken rice is fried first and then steamed in the chicken stock.